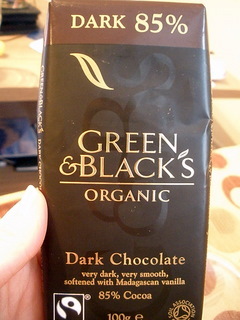 I have a feeling Green & Black’s would taste good any day, not just after a chocolate fast. But this 85% dark chocolate bar, which is surprisingly mellow and smooth with a perfect snap, was a really excellent way to end Lent and celebrate Easter. I am really glad this week is over (no work tomorrow because of Good Friday — hooray!!). Even though it was a short week, the stress made it feel endless. I had about a million different appointments. I found out that I’ll be going to St. Petersburg for two weeks in November for work (this terrifies me). Within the next two weeks at work I have a pretty intense exam and five different training sessions to attend (two of which will be crash courses in Russian, which will hopefully make the prospect of going to Russia slightly less scary. I hope to learn the Cyrillic alphabet and how to ask “Does anybody here speak English?”). I have an essay to write (this is voluntary, but I’d really like to enter this essay contest). Next weekend is one of the biggest party weekends of the year in Estonia, but I probably won’t be able to partake because the aforementioned exam is three days later. In short, I’m really grateful for this three-day weekend, since I’ll have time to both relax and do some productive things (write and study) before diving into all this craziness. We started it off right — J cooked up some tenderloin with a cream sauce and I roasted potatoes. 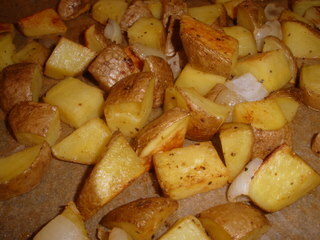 Is there anything more delicious than potatoes roasted with olive oil and a little salt? This pan also included a chopped onion. Definitely one of my favorite comfort foods, and necessary on a night like tonight. 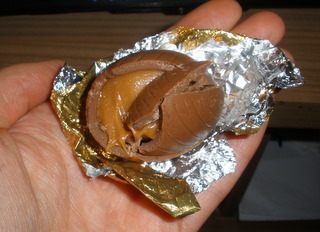 And speaking of comfort foods, only two more days without chocolate! You better believe I’ll be eating an all-chocolate diet on Sunday (just kidding. I think). Like most men, J has a pretty hearty appetite. If there’s a food he likes around, he is likely to eat quite a bit of it. J also works from home, so he grazes the food we have there all day. If there are leftovers in the fridge when I leave for work in the morning, there’s no guarantee that I’ll be seeing them when I get home later. Usually this is fine, as I’m used to it. I’m not territorial over the food in the kitchen… with perhaps one exception. It all started with the toasted, salted nut kick we’ve been on recently. I toasted some almonds to chop up and use on salads, yogurt, etc. J discovered that toasted nuts taste a hundred times better than their raw counterparts and said “You know what would make these even better? Salt!” I’d never thought of making my own salted nuts before, but as it turns out, it’s super easy. First I made a batch of salted mixed nuts, then later just salted peanuts, which J loved. That’s how I think I may have gotten myself into trouble. See, I love peanut butter and eat it every day, but it’s always been just “my thing”, my little American quirk. I have my peanut butter jar(s) and J doesn’t touch them. I go through them at my own pace and, when there’s a spoonful or two left in a jar, I use it as a delicious receptacle for my morning oatmeal. However, much to my dismay, J came to realize that toasted peanuts are amazing and that peanut butter is just like delicious roasted peanuts, except in wondrously creamy form. 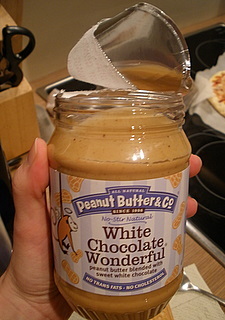 As I watched in horror, he pulled my jar of White Chocolate Wonderful peanut butter from the shelf, helped himself to a spoonful, and said, “Man, that’s actually really good.” Noooo — what have I done?? I suppose I should be pleased that he realizes that peanut butter is not just some weird American obsession, but a genuinely delicious and versatile food product (because who doesn’t like to say “I told you so”?). 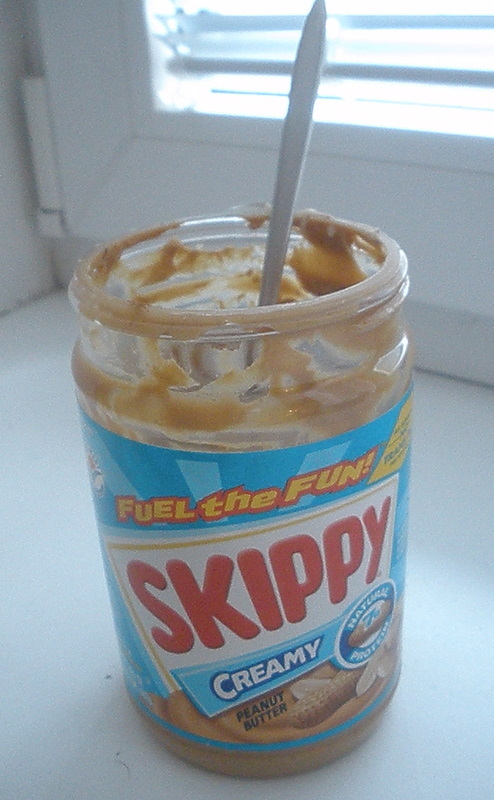 On the other hand, I’m afraid I’ll be kissing my (dear, precious, expensive—a jar of creamy Skippy is 3.50 EUR at Stockmann!) peanut butter stash good-bye once we have two avid peanut butter eaters in the house. Sigh. 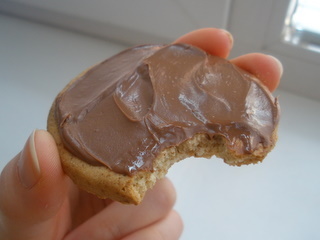 If you come to visit us, bring some peanut butter, won’t you? My current favorite tea came back from London with me after my most recent trip. 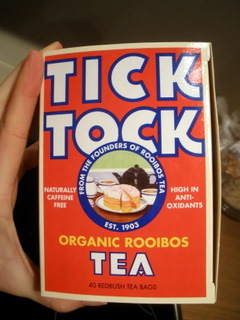 I had already purchased two teas that I thought were interesting — a mango-flavored green tea and a vanilla-flavored white tea — so it was almost as an afterthought that I grabbed a box of plain old rooibos tea bags (Tick Tock brand) during a rushed trip to Waitrose. I didn’t expect it to be anything special, just wanted one more variety so we’d have plenty to choose from at home (as you can tell, I like caffeine-free tea because I usually drink it right before bed). I had drank rooibos tea before, but it’s always had some kind of citrus or other fruit added (I’ve had blueberry rooibos tea, for example). 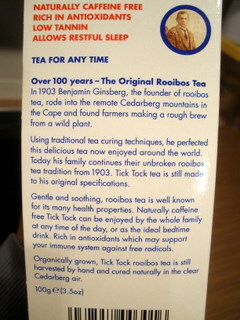 This tea is just plain rooibos with nothing else added, but it absolutely blew me away. It is so incredibly flavorful. I can taste fruit, and cinnamon, and hints of other spices. 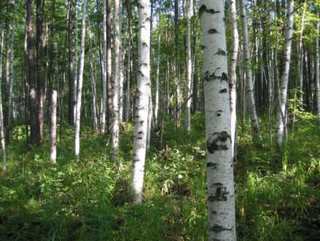 I don’t need to sweeten it because it has natural sweetness as well. I drink tea but I don’t usually crave it, but this tea is an exception.